The servo valve technology allows for rapid change from poitive to negative pressure. This rapid change enable effective cough augmentation. Pressure delivery is monitored at the patient end of the breathing circuit enabling accurate and safe settings. Programmable MI-E mode options as well as triggered MI-E and IPPB mode are available. This offers versatile treatment options to treat a wide group of patients. Multiple power options, with the choice of clearway trolley and mobility bag, enable safe, effective treatment on the go. 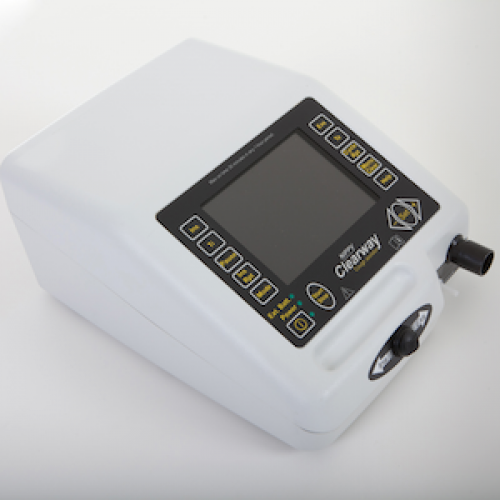 Remote hand held, or foot operated, manual switches provide teh option for carers and clinicians to have direct contact with the patient to enable more effective titration and on-going therapy. 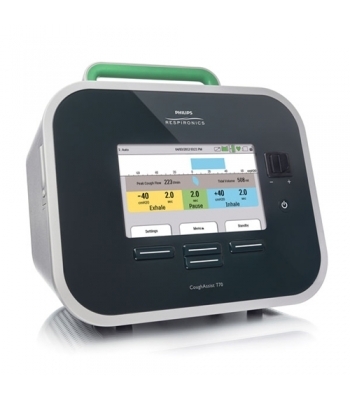 A synchrony beep sounds prior to the delivery of the negative pressure (exsufflation) in the automatic programmable modes, to improve patient compliance and synchrony. You are able to monitor the therapy on the device, as 28 days of stored compliance data is available. The Nippy Clearway has a large colour display, the option to limit available modes and lockable settings, which allows for intuitive use and quick setting adjustment. Up to 15l/min of supplementary oxygen can also be entrained via the circuit.